The Animal Welfare Society is proud to partner with the Maine Correctional Center (MCC) on an exciting and heartwarming program: Paws in Stripes. This program pairs prison inmates at MCC with puppies transferred to AWS through our Paws Across America program. Once the puppies arrive in Maine, they are monitored for health, are spayed/neutered and receive necessary vaccinations. The puppies are then delivered to MCC and into the waiting hands of their inmate handlers. MCC officials select handlers based on exceptional behavior and willingness to learn. The puppies spend six weeks with their handlers learning how to be a great dog. 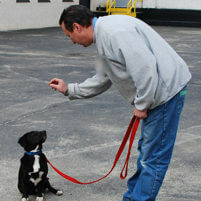 Weekly canine training classes are taught on site by AWS staff. By observing and participating in these classes, the handlers learn training methods that they reinforce daily with their charges, teaching the puppies basic commands. The dogs are housed directly with their handler, making housebreaking a priority. The pups play together daily in the yard, where they run in the grass and say hello to everyone. Being exposed to this new environment with its many new faces helps the puppies learn crucial adjustment and social skills. After six weeks of training, the puppies graduate from the program and are ready for their new homes and become available for adoption at AWS’ Adoption Center. As with all adoptions, Paws in Stripes puppies are available on a first come, first served basis. At the time of adoptions, the new families receive a journal kept by their puppy’s handlers. It outlines their puppy’s growth, development and training skills learned for the duration of the program and is a cherished keepsake for the puppy’s new family. Paws in Stripes is a win-win for everyone involved – the inmate handlers, the prison staff, the puppies and their new families!